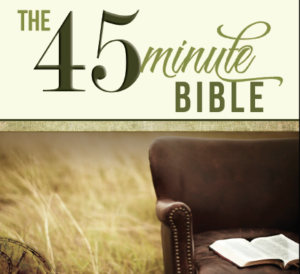 Learn the Bible in Just 45 Minutes… for FREE! The Bible in 45 minutes? Really? Can you actually learn the Bible in 45 minutes? Yes you can! Obviously mastering the details of the Bible takes much longer, but you really can grasp the big picture of the Bible’s message and flow in 45 minutes. The 45 Minute Bible video combines state-of-the-art video and graphics to provide a user-friendly experience that can either introduce you to the Bible, or deepen your existing knowledge of this timeless book! Dr. Michael Bogart’s seminary degree in Bible and doctoral studies in education, along with 40 years of experience teaching the Bible in churches, seminars, and secular college classrooms have given him a unique overview perspective on this book of books. Simply sign up for our e-newsletter using the form on this page and you’ll get instant access to the free version of The 45 Minute Bible video. You will be surprised at how much you can learn in just 45 minutes! Michael Bogart, President of Aspect Ministries. Join Our Mailing List & Get The 45-Minute Bible for FREE!